Posted January 6, 2018 by Belly Dance Tucson & filed under Belly Dance Tucson Events. 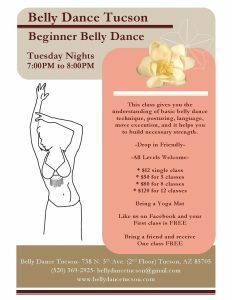 Kick off the new year and get in shape with a friend by belly dancing in our drop in friendly beginner belly dance class starting January 9th at 7PM to 8PM. Can’t wait to dance with you!